IT’S OFTEN labelled a political ‘giveaway’ – winter fuel allowances, free bus passes and other initiatives – all aimed at the most important constituency of all: those people who actually vote. Many young people might question why the introduction and then trebling of tuition fees wasn’t considered as politically risky as removing pension aged benefits, for example, or why the scrapping of Educational Maintenance Allowance (EMA) went through without comparatively much of a backlash. It would be nice to explore the rich analysis and research behind all this, but the answer is as simple as the power of the ballot box. It would, after all, be a foolish politician who messes with the biggest group of people who actively turn out to vote. At the last General Election more than 74 per cent of over 65s voted – compared with just 51 per cent of people aged 18-24. Even when turnout amongst young people fell to just 38 per cent in 2005, candidates could still rely on the over 65s: of whom 74 per cent cast their votes. This week I’ve invited Oldham Youth Council to blog about this issue. I’ll now hand over to them to make the case for engaging young people and the importance of voting. It’s true that voter apathy is a term often associated with young people. In England, the youngest age group to be given the civil right to vote are the 18-24s. This demographic has the lowest voter turnout in the UK compared to an already poor turnout in general elections. It’s unfair to assume young people are the only politically disengaged members of society as voter apathy is an issue affecting everyone. However, the low voter turnout does confirm youth disengagement within politics is a more urgent matter for us to address as a nation – because young people are the future of democracy. If we’re not engaged now, where does that leave the democratic processes the UK prides itself with in 20 years’ time? The first steps in tackling this problem would be to lower the voting age and allow 16 and 17 year olds to have the right to vote in democratic elections within the UK. At 16, young people are already given many responsibilities in our society, like paying income tax and National Insurance, gaining welfare benefits, consenting to sexual relationships and joining the armed forces – yet we can’t vote for a party or politician to represent us in Parliament. Those against the idea of lowering the voting age often pose the argument, how young is too young? Why 16, why not 12? The simple answer is the principle of ‘no taxation without representation’. As pointed out earlier, 16 is already seen as a milestone in a young person’s life. We’re given so many responsibilities, so why aren’t we also given the right to be able to vote? Another argument against the cause states that young people aren’t wise enough to make sound decisions on their own and that parents can represent their views effectively. This was the same argument posed to the suffragettes (i.e. men can make decisions on behalf of women) when they fought for the right to vote. Frankly, there is no difference between the intellect or competence of a 16-year-old vs an 18-year-old. Therefore, it’s unfair to disenfranchise a part of society when we’ve so clearly learnt it’s not democratic or inclusive.In the recent Scottish referendum 16 and 17-year-old young people were given the right to vote. Many of them used that right and the world didn’t end(! 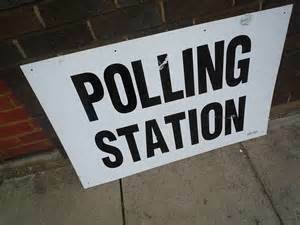 ), so it’s time all the UK’s young people enjoyed the same right to vote in all elections. 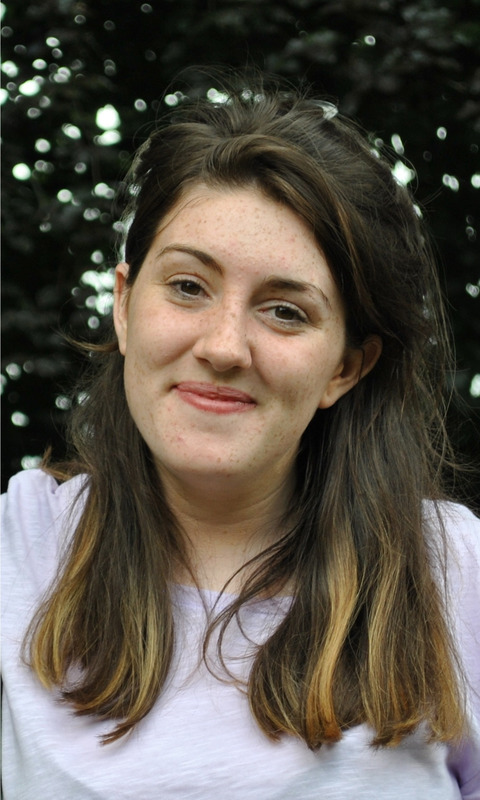 Locally, Oldham Council has pledged their support to the Oldham Youth Council’s campaign for votes at 16. In 2013, the youth council posed a motion at Full Council around this issue and gained a positive pledge of support. Since then local authorities all over the UK have been inspired to do the same. This is an example of local democracy at its finest. We have been involved in a lot of work around reviving the British youth vote through the ‘league of young voters campaign’. This aims to increase voter turnout in democratic elections for 18 to 24 year olds. So far we’ve been to colleges, schools and carnivals encouraging young people to get on the electoral register and make their mark. Furthermore, last November saw Oldham Council as a local authority and Oldham Youth Council take part in the first meeting for the “Inter-cultural Dimension for European Active Citizenship” (IDEA-C). This is a response to the low voting turnout rate in EU elections, suggesting some European countries may face, or soon face, a democratic deficit. The project aims to restore electoral faith among EU citizens and chose 13 organisations/institutions each from different EU countries to take part. Oldham Council was able to share their best practice as a cooperative borough and Oldham Youth Council was used as an example of how local democracy can and will engage young people to be active citizens. We’re looking forward to organising and delivering an event for Oldham’s young people that will focus on reviving their participation in democracy and we need your help to do this. The Youth Council strongly believes that young people and adults in our borough actively engaging in politics is the first step towards making the UK a more democratic place. We urge all Oldham’s young people to get involved, get on the electoral register as soon as you are eligible, go to the polling stations and vote – have your say! And if you’re reading this and thinking you don’t ‘do politics’, you do. From the tax you pay on your trainers to the exams you have to sit, or the fact that there is no Education Maintenance Allowance and down to your views on the provision of youth facilities – that’s all politics and your voice counts. 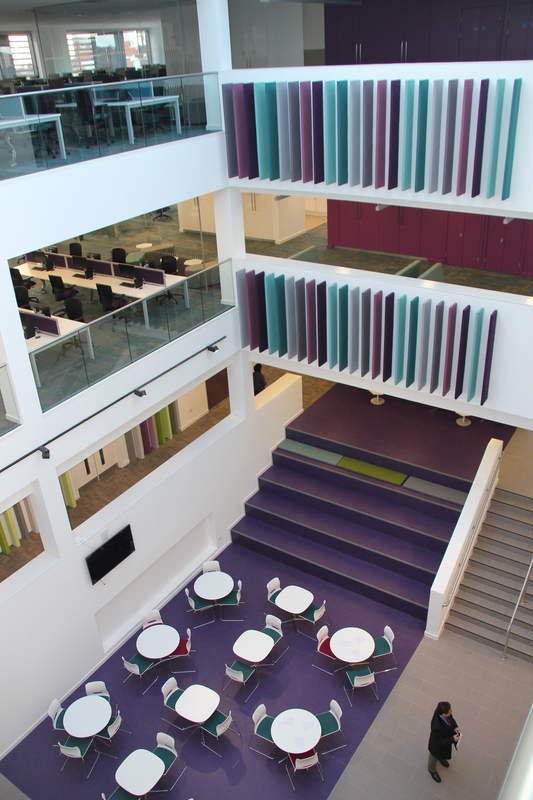 FIRST PLACE: The stunning interior of FCHO’s new headquarters on Union Street. IT’S JUST under a year ago now since I took part in a steel signing session at the site of the new First Choice Homes Oldham (FCHO) offices – how time flies! Last Thursday I was lucky enough to get an early peek at the inside of the new building on Union Street, which is to be known as First Place. I was there to attend an Oldham Leadership Board event – and I have to say what I saw was very impressive. With office and meeting space over four floors, this building will now be home to more than 250 employees and provide an improved Customer Zone with free access to online services, free phones and better interview facilities. Its’ completion is a real landmark in our regeneration agenda and it was a fantastic vote of confidence that FCHO chose to invest in Oldham and remain in the town centre. Eleven local apprentices have been employed on this construction project across a number of trades including heating engineers, electricians, dry liners and painters and decorators. In addition to creating local jobs and apprenticeships, this project has also put money back into the local economy with the overall spend with local suppliers currently standing at more than 55 per cent. The new building has also particularly boosted one of our existing small businesses. Local entrepreneur Gordana Nield who owns Café 22 on Clegg Street, is set to run the new onsite café at First Place. 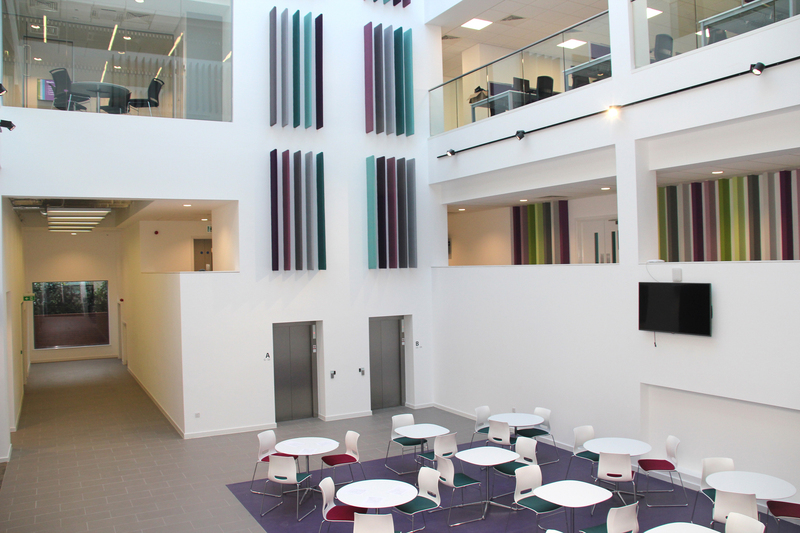 Her venue – to be named Café 22 @ FCHO – will be open to onsite staff and visitors. Café 22 was recently named as one of the top 10 independent coffee shops in Greater Manchester by readers of the Manchester Evening News, so everyone should be in for a real treat. As you can see then, First Place is quite literally ‘made in Oldham’ right down even to its purple paint and its cupcakes! Quality housing is key to the regeneration of the borough and the visit to the new FCHO building caused me to reflect on how far we’ve come since the transfer of the housing stock to FCHO in February 2011. FCHO taking on responsibility for around 12,000 homes from Oldham Council enabled them to unlock £149 million worth of funding for carrying out vital home improvements. They are well on with the improvements programme which since 2011 has seen 5,799 new kitchens, 4,817 new bathrooms, 3,018 new boilers, 2,953 new front doors and 1,374 thermal improvements…a hugely impressive list. FCHO and partners are also underway on a £10 million Eco scheme in central Oldham, with a further £11 million of investment in local properties and the environment. The B Green project is a partnership between FCHO, Oldham Council, British Gas, Forrest and Savills, to install energy efficiency improvements for around 2,400 residents. These improvements are important if we are to build strong communities in Oldham. We want people to aspire to live here which means offering good quality housing – and that applies to all homes regardless of whether they’re rented or privately owned. Oldham Council is also now cranking up the pressure on those people who provide homes that are not fit to live in. Just this week we successfully prosecuted a private landlord for failing to ensure his properties were safe. Two of the homes did not have any fire detection systems and both the electricity and gas supplies had been tampered with. In total there were 13 breaches of the law. This is simply not acceptable and we will not let our residents be ripped off and put in danger in this way. That’s why last December we approved our Private Landlord Selective Licensing Scheme – to stamp out the letting of poor quality accommodation. This will be introduced from May 1 across eight areas in our borough. The aim is to improve the management of privately-rented properties to ensure they have a positive impact on the area. We will not put up with poor practice in Oldham – our residents and communities deserve better. And finally – and talking of standing up for residents – it would be very remiss of me not to mention how very sad it is that Harry Burns will not be there to see the official opening of First Place on Friday. The chairman of FCHO from 2004 until the time of his death late last year, Harry was a champion for improving social housing. He was a proper Oldhamer who told it how it was – and he was a man of real conviction and dedication. In 2012 Harry also became the first-ever person to be presented with the Civic Appreciation Award. So whilst he may not be there in person, I’m certain Harry will be there in the hearts and minds of those attending: particularly his wife Louise, who will be opening the building. It will make for a fitting tribute to a man of the people. WE HOSTED a surprise visit to Oldham last week by the Rt Hon Hilary Benn MP, who is the Shadow Communities Secretary. We were delighted to receive him and keen to urge Hilary, as we have done with other parties, to keep the need for urban renewal firmly in mind. There is a currently lot of debate and discussion nationally about building new homes and that is welcome. We mustn’t forget, however, that there are large swathes of the country – in particular in the North – where far too many properties remain unfit. Homebuyer demand is weak and that creates fertile ground for some private landlords to buy cheaply and make a killing on rent, often paid for by taxpayers through housing benefit. We need to rethink how we use public money and use whatever cash is available to invest in long-term decent homes which help to create stable communities. Simply paying out money year after year to private landlords who don’t invest back into their properties isn’t a good use of money – and it isn’t good for tenants either. Hilary Benn’s visit coincided with the launch of the unofficial General Election campaigns of all political parties last week. The starting gun for May 7 has already definitely been fired and, whatever your political view of the world, we’re all in for an interesting few months. The subject of elections is what I want to blog about this week although not the politics behind them (you might be glad to read! ), but the actual process. Since last summer Oldham Council has been working to implement Individual Electoral Registration, which is the government’s new system for registering to vote. With more than 160,000 people eligible to vote across the borough, this is no simple undertaking. Registering to vote is important. It ensures you can have your say and influence the decisions that affect you, so you need to make sure that you’re on that new electoral register. The new system requires anyone needing to register to vote to provide their National Insurance number and date of birth. This information is then checked by matching the details to the data held by the Department of Work and Pensions (DWP). Oldham’s electoral register was sent for checking back in June last year and proved to be an 82 per cent match with the data held by the DWP. A local data matching exercise was then undertaken against Council Tax records, which increased that overall figure to 84 per cent. Following a period of canvassing from July to November last year we have to date now matched 88 per cent of electors under the old system and re-registered them automatically under the new system, which is fantastic. But that does mean there are still around 7,000 local electors who haven’t been matched under the new system so we are now encouraging these people to come forward. How are we going to do that? Well, we’ll be writing to every household at the end of January/beginning of February advising them which individuals we have registered at that address and asking them to contact us if the information is incorrect. If you are not sure if you are registered under the new system then you should call the Elections team on 0161 770 4718 – and will need to provide your National Insurance number and date of birth. Being registered is vital because anyone who hasn’t registered to vote under the new system by the end of 2015 may receive a fixed penalty notice – so make sure that’s not you(!). Your democratic right to vote is also, of course, hard fought and important, so please ensure that you are registered and engaged. Finally this week, I was honoured to attend a commemorative event for the late Councillor Phil Harrison last Friday. Phil was a dedicated public servant who fought hard to give a voice to those who found it difficult to speak up for themselves. His portfolio as a Cabinet Member was for social services and community health, and as part of this he led the work for the Link Centre to become a facility for independent living where people with a wide range of disabilities can get advice and support to live independent lives. I am delighted a suite at the Link Centre has now been named after him. Remembering those who make a difference is important. WINTER IS well and truly upon us and – as our gritters work their way around the borough keeping us all moving and safe – we can already see the impact of freezing temperatures on the roads. I’d like to thank our hardworking team who worked round the clock over the festive break against the elements. I know many residents appreciate that this is no easy task, but it is also one that is vital to local communities. We also know how important the condition of roads is to all residents. No one likes driving over a pothole or the damage they can cause to vehicles and pedestrians, not to mention cyclists. I have covered this topic before and it also got a significant mention in my Annual Report to Full Council, but it’s an issue that won’t go away and we’re constantly looking at ways to make our roads better. Road maintenance has been seriously underfunded for decades nationally leaving many towns and cities in a scenario where their work is just about dealing with the most severe cases. As it stands one in five roads across the country are now classified as being in a poor condition. Hot off the press a new report covered by the BBC has again highlighted the very serious situation we find ourselves in. Despite the latest £6bn investment from government the funding gap is getting bigger and bigger. The true cost to bring roads up to a decent standard across the country now stands at £12bn, or even higher according to the asphalt industry. In Oldham our repair backlog now stands at around £60m with neighbouring Rochdale not far behind. Many will say that council has failed to invest, but that just isn’t right. 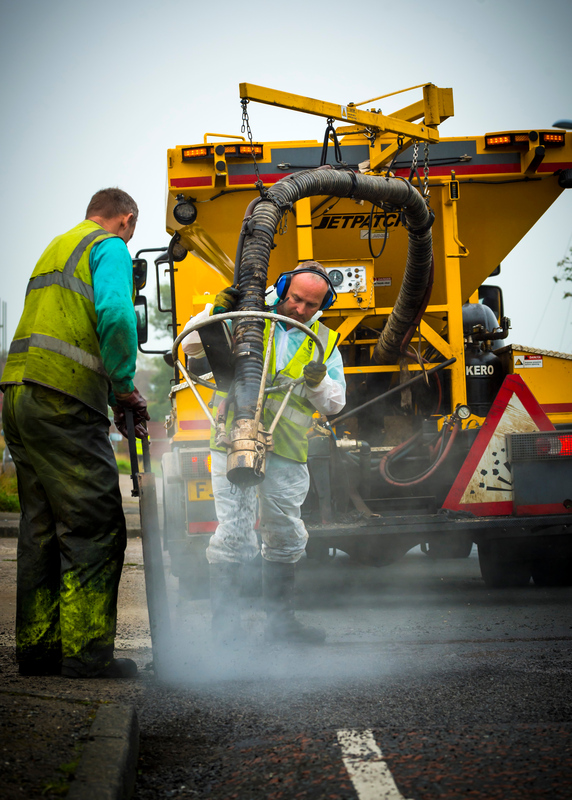 Every penny which comes to us for highways maintenance is spent on road repairs. The truth is that government do not provide anywhere near enough to cover the true scale of the challenge. We surely can’t continue to just patch up and fill individual potholes when the roads need more fundamental work and only complete reconstruction or resurfacing will solve the problem. With an estimated 42 per cent increase in traffic volume forecast by 2040, it’s clear this problem won’t be going away. The Local Government Association is now spearheading a campaign as part of its 100 days in office plan for whichever government takes power in May. The plan makes a great deal of sense and I expect the vast majority of the public would agree. It would see an additional £1bn a year being directed to road repairs (not simply building new roads or new expensive engineering schemes) by allocating just 2p per litre from existing fuel duty. Motorists paying into a system which in turn benefits every road user can only be a good thing. Meanwhile we’re not sitting idly by and hoping someone eventually sorts our roads out for us in Oldham. We’ve worked hard to catch up and this year alone will have invested £17m in transport and road repairs. That funding means every one of our ‘A’ main roads will have a 24-hour repair promise in place. That does exactly what it says on the tin. If you report it, we’ll repair it within 24 hours. This ensures the most heavily-used routes are maintained to a decent standard, reducing insurance claims and providing a good service. As with most things I understand that we’re all so busy getting on with our lives that we don’t always remember to report a pothole or damaged road surface we when see it. I would ask that you please do your bit by letting us know because we can then arrange to repair the most urgent. To do that you can now sign-up to your own My Account on the Oldham Council website. This new system lets you manage all your involvement with the council in one place – from claiming benefits to reporting litter and potholes. If you haven’t already registered to use this, please do so. Not only is it convenient but it also saves the council – and in return, you – money. – Werneth Park (car park), Frederick Street, Werneth.